Little stands and stools are so practical and we love them at Mrs. Nicholson Home! 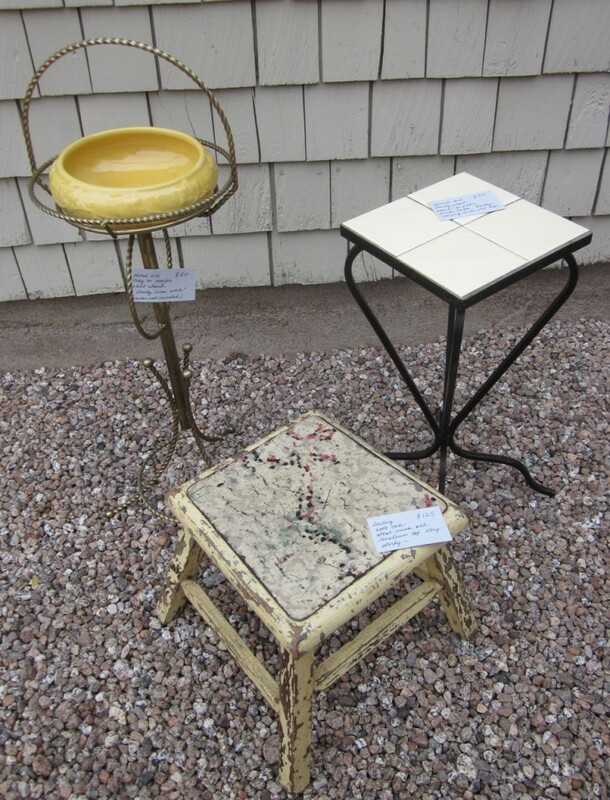 In the photo below, the metal plant stand could hold a variety of pieces of pottery (yellow or not) and be used for dropping keys at the front door, showing off a small collection of postcards or other treasures, keeping balls of yarn away from your cats or even growing a small plant. The yellow-tiled table with its sturdy legs and sweet design is perfect for a drink on the terrace and the absolutely darling linoleum-topped oak stool would be a perfect “step-up” or “perch-down” in your kitchen, laundry room or bathroom adding that little vintage touch to your space. and linoleum-topped oak stool ($125).